Thoroughly mix all the ingredients for the meatballs. When the mixture is ready, form individual meatballs and store in the refrigerator. Pour the beef broth into a medium-sized pot and bring to a boil. Then add the reserved meatballs to the broth. Cook for 20 minutes before incorporating the vegetables, green beans and quinoa. Let simmer for five more minutes to let all the sabores fully combine. Remove from heat and sprinkle with fresh cilantro right before serving. To prevent the meatballs from losing shape while cooking, refrigerate for 15 minutes before adding to the soup. I have always thought that even in warm weather, soups are comforting and can make anyone feel better. If you don’t know which recipe you should pick to surprise your family, this quinoa soup with meatballs could be just the right idea. Quinoa is a classic ingredient in Latin American cuisine, and it’s prepared in a variety of ways. 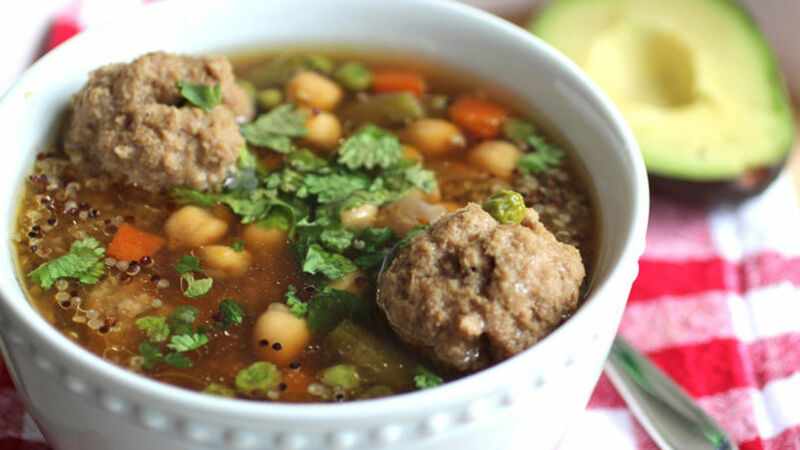 For this recipe, it’s served as a savory soup with beef broth, vegetables, chick and meatballs. This nourishing soup surely deserves a place in your next winter menu… disfruta!